If you like stuffed bitter melon but don't like the bitterness you will like stuffed cucumber. 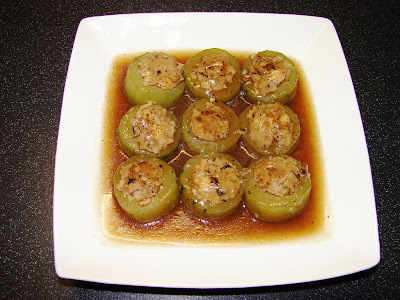 The sauce for stuffed bitter melon is normally quite strong to cover the bitter taste while the sauce for stuffed melon is normally very mild not to interfere with the delicate taste of cucumber. Chinese winter melon or courgette can also be used for this recipe. If using courgette do not peel. Peel the cucumber, top and tail then cut into 2 cm thick slices. Use a small knife and cut out the centre and leave about 12 -15mm hole in the centre. You will probably get about 12 - 14 pieces. Blanch the cucumber for about 5 minutes in boiling water. Drain. Mix the stuffing ingredients together. Stuff the cucumber slices. Leave some stuffing sticking out at both ends spread the stuffing large than the hole (this will prevent the stuffing falling out). Very easy to stuff, take not time at all. In a wok/pan, add the oil and fry the garlic till fragrant. Add in the stock or water and oyster sauce, bring to the boil, add the stuffed cucumber slices. Cover and simmer for about 5 - 10 depending on how soft you like the cucumber, the longer you cook the softer the cucumber. Push the cucumber gently to one side of the wok/pan, there should be quite a bit of sauce leave, if not add more water, add some soy sauce to taste, some cooking wine, pinch of pepper and dash of sesame oil then thickened with a little cornflour mix with a little water. The sauce should be lightly thickened not gloppy. Ready to dish out and eat while hot. * If you don't like a brown sauce using oyster sauce and prefer a very light colour sauce you can just use chicken stock lightly seasoned with few drop of light soy and few grains of salt.